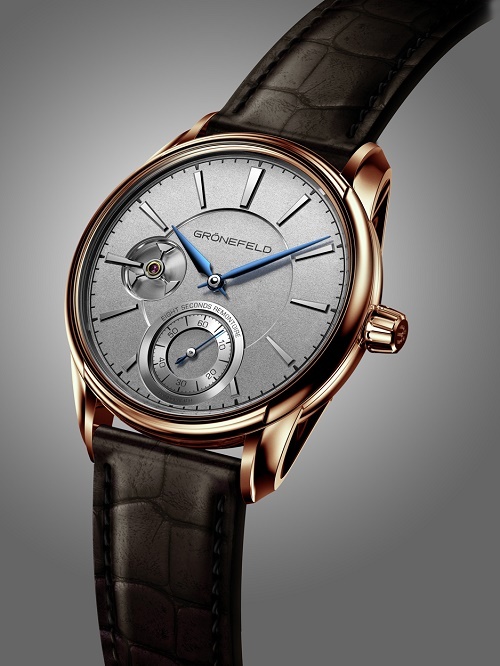 The Grönefeld 1941 Remontoire. A Continuum. The Grönefeld 1941 Remontoire has been created with a nod to historical watchmaking skills and to the heritage of its creators. It is difficult not to sit up and take notice when there is a new Grönefeld watch. And it is equally difficult not to be caught up in the enthusiasm which these two watchmaking brothers bring to the industry – anyone who met them in the days and weeks after they scooped their GPHG award will attest to the fact that they were as giddy as two schoolboys, and certainly they are an endearing pair. Their latest piece not only represents the Grönefeld watchmaking dynasty, it is also a legacy of this family’s horological mastery. A “Remontoire” is one of watchmaking’s more romantic inclusions. It is not essential, but rather it denotes the essentia of high-end horology – a layman would not give a hoot for its accuracy-boosting capabilities, nor the tricky nature of its assembly, but produce one at a gathering of watch aficionados and you will enjoy an immediate and hushed reverence. The new Grönefeld 1941 Remontoire pays a tribute to Johan, the boys grandfather and their father, Sjef, but it also recalls halcyon childhood days playing to the sounds of their local church clock, which was maintained by Johan and later by Sjef. The Saint Plechelmus clock had, by necessity, a remontoire to prevent its escapement shattering under the force of its movement arrangement, so this piece is not simply a tribute, it also marks a very authentic continuum. ….. And it is beautiful – an uncluttered case, grainy silver dial with slightly recessed indications and bevelled edges and meticulous finishing throughout. Inside the 39.5mm case, the Swiss manual-wind Grönefeld in-house calibre G-05 will keep perfect time right to the end of its 36 hour reserve of power thanks to the remontoire, and there are subtle and very unique references to the watchmakers homeland in the finishing of the bridges. The case of the “1941”, which is a new design, is named to mark the year of their father’s birth and if this watch has also been made in recognition of the hours spent gazing over his shoulder as he worked at his bench, then I can think of no finer compliment. The Grönefeld 1941 Remontoire will be available with 18kt White gold or red gold case options, limited to 188 pieces.